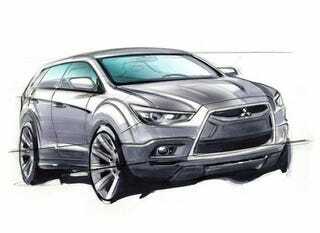 We're guessing this sketch of the next Mitsubishi crossover, based on the ferocious little Concept cX, will not actually be called "game changer" when it goes into production next year. Seriously, it's not the game it's the player. Mitsubishi admits in their press release they're going to make a strategic shift from "being an SUV-focused nameplate to a manufacturer of environment-friendly passenger cars & crossovers, with a presence in the "authentic off-roader" segment." We look forward to the authentic off-roader segment and a move away from utterly forgettable cars (with the exception of the EVO and Lancer Wagon). They claim this to be "pre-empting" the change in the market, which we think is a charitable description of where the market is. Either way, it's a step in the right direction.